Welcome to March, 2017 issue of GL Communications' Newsletter providing information and insight into our enhanced End-to-End Wireless Network LAB Solutions (2G, 3G, 4G and IMS). GL provides both Radio Access and Circuit Core Network versions as shown below. GL supports a wide range of wireless network simulators, which provide reliable integrated solutions to vendors and service providers for Testing, Simulation, Monitoring, and Troubleshooting 2G, 3G,4G and IMS networks. These networks can be invaluable for protocol characterization and testing, performance measurement, and training. GL's MAPS™ 2G, 3G, 4G, and IMS Lab Suite along with Radio Access Elements are a set of test systems used to provide an advanced full-fledged network environment that enables user to test their applications, devices, and services prior to deployment on a real-time network. The test suite can be used to simulate all or specific elements within wireless networks infrastructure using simple ready-to-use test bed setups. The test systems allow for simultaneous execution of various test cases across networks. It also allows for performance and conformance testing compliant with 3GPP standards. GL’s MAPS™ SIP IMS test suite added to provide an advanced full-fledged network environment that enables user to test their applications, devices, and services prior to deployment on a real-time IMS network. It can be used to simulate all or specific elements within IMS network infrastructure using simple ready-to-use test bed setups. The network architecture outlines the implementation of Wireless Networks Lab with the help of GL's MAPS™ Platform. Real mobile phones can be used with GL’s Wireless Network Lab suite to create a real-time Wireless Network Environment. 2G, 3G, 4G and IMS network scenarios that can be simulated using MAPS™ are discussed in the following sections. MAPS™ 2G Lab System can test BSC completely by simulating several BTS nodes on Abis interface. Similarly, MAPS™ 2G LAB System can also test MSC and SGSN/GGSN elements on the A and Gb interfaces respectively. With this simulator we provide circuit switched traffic through RTP. MAPS™ SGSN emulator can be configured to simulate both SGSN and BSC nodes as depicted in the network setup below. It supports both control-plane and user-plane packet switched traffic. MAPS™ 2G Lab Systems can be used to simulate multiple instances of nodes in network such as MSC, BSS, SGSN, and GGSN to perform functional and load/stress testing. The lab system can operate with real mobiles or optionally with a simulator such as GL's TRAU Testing Solution. MAPS™ 3G Lab System can be used to simulate a complete 3G UMTS network, allowing various network elements testing including RNC, MSC, SGSN, GGSN, Home NodeB, Home NodeB Gateway, and NodeB. The possible simulation includes both User-Plane and Control-Plane; circuit-switched voice and packet-switched data traffic simulation, resembling real user activity (like web-browsing). MAPS™ simulator can be used to simulate multiple instances of nodes in network to perform functional and load/stress testing of the network elements. The lab system can operate with real mobiles or in combination with a simulator. MAPS™ 4G Lab System for LTE can be used to simulate both E-UTRAN and EPC (Evolved Packet Core) allowing complete testing of the LTE network. 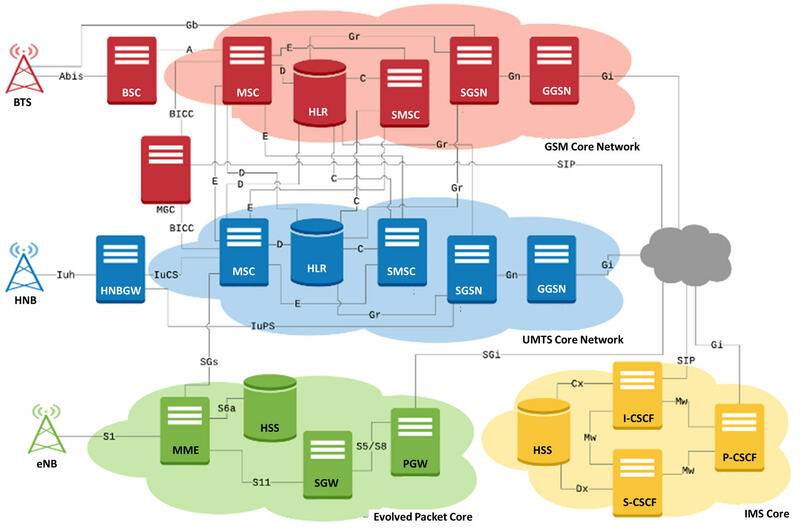 The 4G Lab System can configure various nodes in LTE network including eNodeB, MME, Serving Gateway, PDN Gateway, HSS, SGSN, PCRF, PCEF, AF and others. The lab system is validated against real-time equipments. Feature and load/stress testing over User and Control Plane is possible replicating real scenarios. The lab system can operate with real mobiles or in combination with a simulator to simulate data traffic including VoLTE. 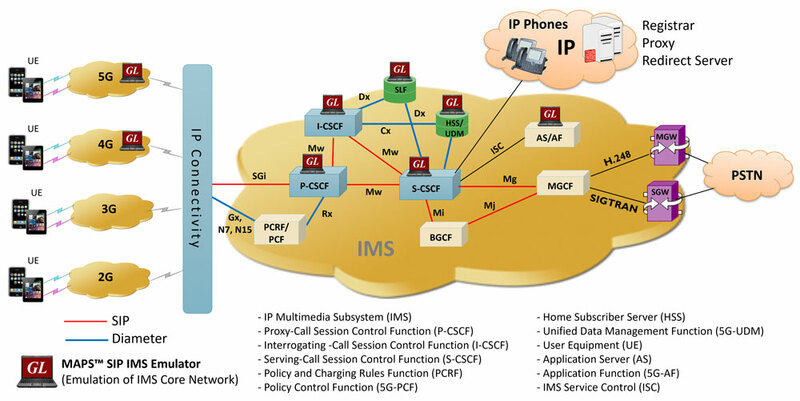 MAPS™ IMS test suite is capable of simulating multiple UEs and IMS core elements such as P-CSCF, I-CSCF, S-CSCF, PCRF, MGCF which provides the IMS core network. With the help of mobile phones, and other simulated wireless networks, the VoLTE Lab setup can be operated in real-time for making VoLTE calls and also for interworking with PSTN and VoIP networks.